Today's entry on Paved mentioned the Chapters store on Bloor near Runnymede. I remember the local controversy when that Chapters was being built because it was assuming the location held by the much beloved Runnymede Theatre. Just thinking about the old Runnymede Theatre brings back a tonne of memories. Growing up in West Toronto, our two prime theatres were the Humber Odeon at Jane and Bloor and the Runnymede Theatre at Runnymede and Bloor. Just about every movie I saw was at one of the two. At the Runnymede Theatre I remember getting creeped out by "Star Trek: The Wrath of Khan", thoroughly entertained by "Beetle Juice" and "Lethal Weapon" and fairly disappointed by "Poltergeist III". It was a fantastic little theatre with a stunning interior the likes of which I never saw in any other theatre. It was a sad day when it shut down for good. 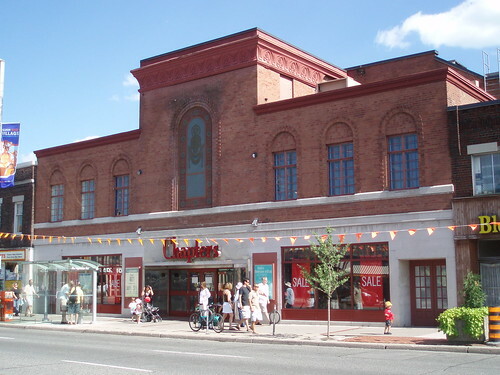 It's tough to find a good picture of the theatre before it became a Chapters. Here's one taken right after it closed and before construction on the new Chapters began. Here's a shot I took of how it looks now. They actually did a really good job maintaining the historical exterior. They did an amazing job keeping the great old interior as well, which you can see nicely in this shot and this one. The days of smaller, charming neighbourhood movie theatres are long gone. All my favourites have shut down, the Runnymede, the Humber and the Uptown. It's really too bad, all we're left with are the memories. With all the talk about the release of the new Indiana Jones movie, I decided to google the Runnymede Theatre and came to this blog. My sister and her husband lived at the Runnymede Arms, just across the street. When Raiders of the Lost Ark was released in theatres, it ran at the Runnymede for over a year. We would sit around in my sister's apartment, wondering how to spend a Saturday evening. One of us would pipe up, "Hey! Let's watch Raiders!" We trooped across the street and paid our pittance, and watched that movie over and over again. Sometimes, the theatre was almost empty, and when the part came when the Nazi truck drive was run over, my sister slid sideways in her seat, arms and legs flailing. The patrons in the rear had a good laugh! I'm disappointed that it is no longer a theatre, but somewhat comforted that it's a bookstore. Perhaps someday one of my books will grace its shelves.